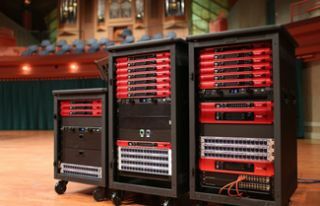 The College of Music at the University of North Texas recently completed a large installation that includes 44 Focusrite RedNet units, which act as interfaces for the Dante Ethernet-based audio-over-IP network infrastructure to connect the school’s two main performance halls. Each of the rooms has its own recording control room and a portable jazz workshop with a total of 64 I/O. Seven RedNet 1 and seven RedNet 2 units provide the I/O interfaces, while six RedNet D16 AES interfaces offer 16 channels of AES/EBU connectivity to and from a Dante audio network. A pair of RedNet D64Rs provides the link between the Dante network and any MADI/AES10 setup, and four RedNet HD32R units are the interfaces that allow Pro Tools HD users direct access to the full benefits of the Dante digital audio networking system. In addition, 17 RedNet MP8R units are eight-channel, remote-controlled microphone preamplifiers and A/D-conversion for the Dante network. A RedNet 3 connects the digital audio systems and components to the RedNet network, with up to 32 inputs and outputs and full software remote control. The system was sold and designed by AV design and installation firm Audio DAWg of Irving, Texas. “They wanted to get the system in and running before the semester began,” said Spunky Brunone, owner of Audio DAWg, who brought the RedNet/Dante combination to the attention of Blair Liikala, manager of recording services at the University’s College of Music.